Are you confused by this? So are compliance teams around the world. Given the breadth and complexity of financial derivatives, determining this exposure can be a huge challenge. Understanding the multi-level construction of the assets in question and knowing when to include and exclude them in the holding calculation greatly complicates the disclosure process. A multi-level construction may only yield a low exposure to the underlying security, but it could be the difference between a 4.98% holding and a 5.01% that breaches a reportable threshold. "financial instruments that are disclosable as either: (i) entitlements to acquire; or (ii) instruments with similar economic effect to holding shares or an entitlement to acquire shares." "where the underlying security represents 20% or more of the value of the basket or makes up 1% or more of the total voting rights of the issuer." 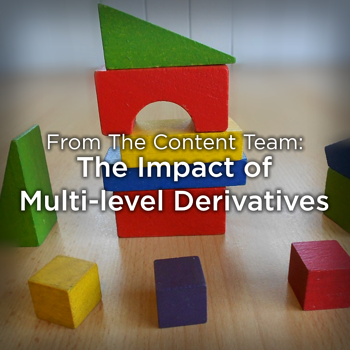 Multi-level derivatives can quickly become the undoing of even the most capable compliance team, due to their extremely complex and intricate nature. Intricacies in the calculations for the above must also be known. For instance, if a fund were to hold the construction above and see a change in the index price, the holder’s exposure to an underlying security would be altered. If such a marginal change results in a disclosure threshold being tripped from one day to the next, a disclosure would be required. In a separate regulatory regime, the UK Takeover Panel for example, such a change is not subject to a subsequent dealings disclosure (assuming 1% or more of a class of security is owned). This highlights that one’s assumptions regarding changes in exposure cannot be extended across regimes within a given jurisdiction, let alone across jurisdictions. Without rewriting the textbook on shareholding disclosure, it’s clear to imagine the benefits of a service that can automatically calculate a fund’s exposure (and thus its responsibility to disclose) from multi-level derivatives, taking into account the nuances from each regulatory regime. Even if one has a solid understanding of their responsibility to disclose, a change in law can quickly make a complicated matter even more so. Rapptr, the engine behind FundApps’ Automated Shareholding Disclosure software, automatically analyses exposure towards an issuer, even from multi-level derivatives, across 85+ jurisdictions. Rapptr monitors over $2tn in assets every day, with a significant proportion of them multi-level. To see our Automated Shareholding Disclosure Service in action, visit our Book a Demo page or Contact Us to arrange a call back.